Physical therapists and strength coaches are beginning to adopt the Pallof press for many of their clients. As a Personal Trainer, it’s imperative that my clients gain functional core strength for two reasons: progression and reducing risk of injury. The core musculature includes, but is not limited to the abdominal muscles. Glutes, hip flexors, back muscles, and abdominal muscles should all contract in synergy for optimal effect. Core strength can also be visually appealing. So let’s take a look at the reasons why I like to include the Pallof Press. With continued use, will develop significant strength and possible physique developments. This is a short introductory video on the Pallof Press… in the future I will produce a more detailed guide to performing the Pallof Press. If all else fails, focus on the core. 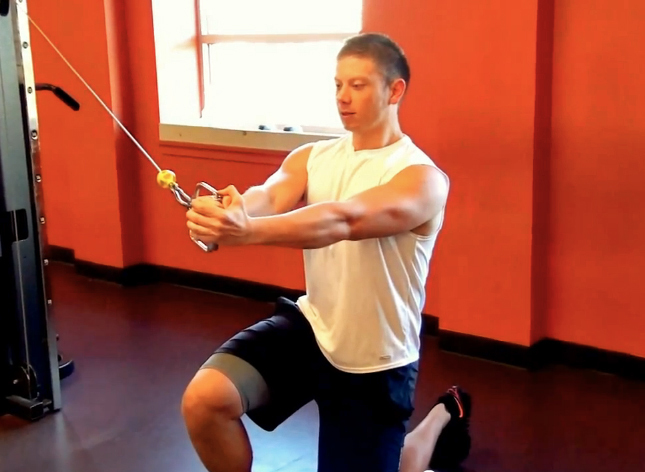 People who hit plateau’s may want to consider focusing on the core for a few weeks. With strong core muscles, you will be able to better activate the muscles throughout the lower body, torso, and extremities. And you’ll look good doing it.